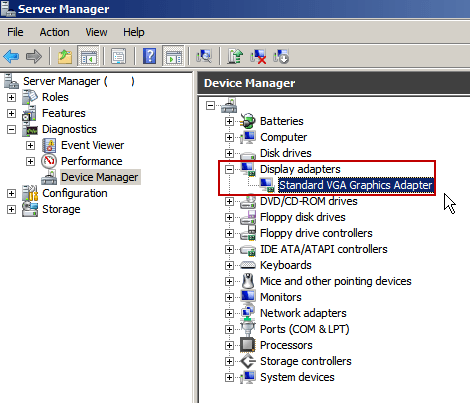 VMware Tools provides many of the needed drivers for a guest OS, such as for video performance. The console of any virtual machine is sluggish without these tools, with the results being a “choppy” mouse feel. However, an annoyance on Windows 2008 (&R2) guests is that even with VMware Tools installed, the video performance is poor. As an alternative, RDP can be utilized to gain access to the virtual machine, however, the console is nearly a requirement at times (such as initial configuration, or troubleshooting a guest that is having network issues). If you need a copy of the wddm_video drivers, I have made them available in a zip file. Click here to download. Although this driver functions on a Windows guest in a VMware environment, it does not provide any of the performance required in the console. Looking at a Windows 2003 R2 Enterprise guest, the driver is listed as “VMware SVGA II” and provides a smooth performance. 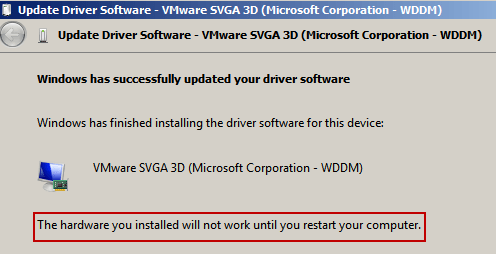 Thus, the issue is that in Windows 2008 the default driver is still active, instead of the VMware driver. This is a simple fix. Per the VMware KB Article “WDDM and XPDM graphics driver support with ESX 4.x, Workstation 7.0, and Fusion 3.0”, the WDDM driver for hardware version 7 is supported, but not installed. The asterisk next to Windows Server 2008 R2 states that “Unless there is an explicit requirement for enhanced graphics, the preferred driver for Windows Server 2008 R2 is the Microsoft-provided VESA driver.” Apparently there were a number of issues where the old XPDM driver was being loaded prior to ESX 4.0 u1. To install a WDDM or XPDM driver go to Control Panel > Device Manager of the installed Windows operating system. To locate the drivers, browse to C:Program FilesCommon FilesVMwareDriverswddm_video on the hard disk. Next, choose “Browse my computer for driver software”. After a brief install, a successful install message should appear. Note: The server will require a restart to take advantage of the new driver. 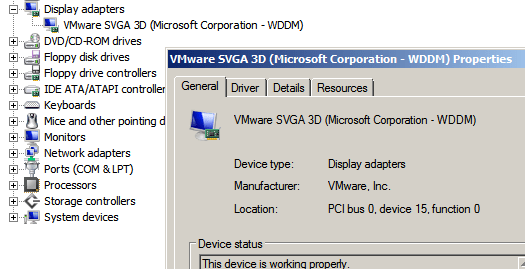 The new VMware SVGA 3D driver is installed and functioning properly. I’ve been running the WDDM driver for quite some time on my Windows 2008 R2 guests without issue. After a month of problem free usage, I’ve upgraded my gold image template of Server 2008 R2 to include this driver. I’d like to find a way to automate the upgrade of the driver via VMware Tools and a command script, but have been unable to do so at this time. I also invite you to check out Chris Colotti’s blog, which verifies that this method improves performance for a vCloud environment as well. Go here to download the WDK (Windows Driver Kit) for a variety of tools. DPInst is the tool we’re looking for. Great article. You might want to post something about the need to up the amount of memory the video card needs with this driver. great article. but i am trouble getting the WDDM drivers installed or downloaded to the server. increased video memory to 35mb. installed tools again using custom and selected to download drives. Using the x64 install. redid the process again nothing – no video drive installed. 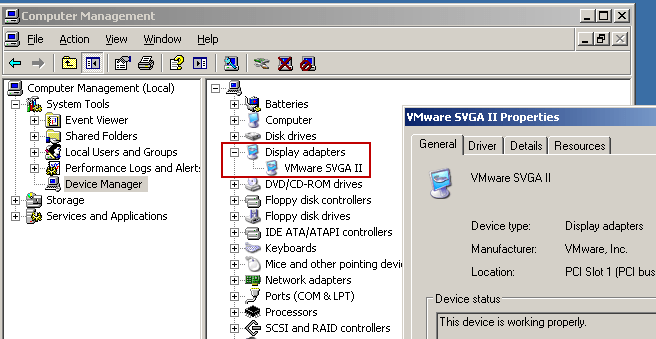 i know to a point that the install of tools works because the mouse drivers change to vmware. I’d check to make sure the files are there. If you browse to the path “C:Program FilesCommon FilesVMwareDriverswddm_video” you should see the driver files. Make sure the VM is at hardware version 7. The default tools bundled with vSphere 4.X should come with this driver by default. I did check three times. i havethis folder C:Program FilesCommon FilesVMwareDrivers but no folder called wddm_video. i also did a search for wddm, nothing. I’ve updated this post with a link to the wddm_video drivers. It’s at the top of the post, or click this link. In the thoughts section you mentioned you were searching for some automated script to carry out this work.. did you get a chance to find a script to upgraded the drivers ? I tried using the DEVCON command but that did not workk out. I did not search very hard for a script, and instead baked in the wddm drivers into all of my templates. I’ve taken to mainly using RDP to manage VMs at this point, and only use the console when I am fixing a network related issue (typically firewall or IPsec). Oracle VM provides a set of drivers Paravirtualized Drivers for Windows Guests XP 2003 2008 Vista 1.0.8 – 32bit 64bit on . 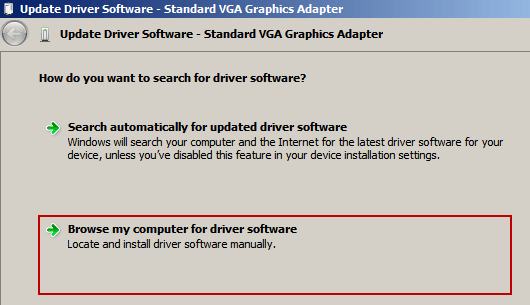 When installing these drivers answer yes to all the questions about the drivers being uncertified. Because the paravirtual driver software has been installed Windows will now be able to actually install and load the drivers for the devices that OVM has made available to Windows. Thanks, Excellent article, helped me to get a couple of 2008 R2 up and running on our old ESX-platform, without freezing any further. Well no big issues in it, those machines are only for test and I get the mouse, when I using RDP. Thanks Michael. This has been a surprisingly popular article, I don’t see why VMware don’t just slip the WDDM driver in with the tools install now that the OS stability issue is resolved. Cool, glad the article helped out. Have fun with your Cisco UCS environment, I’m a fan of their technology. 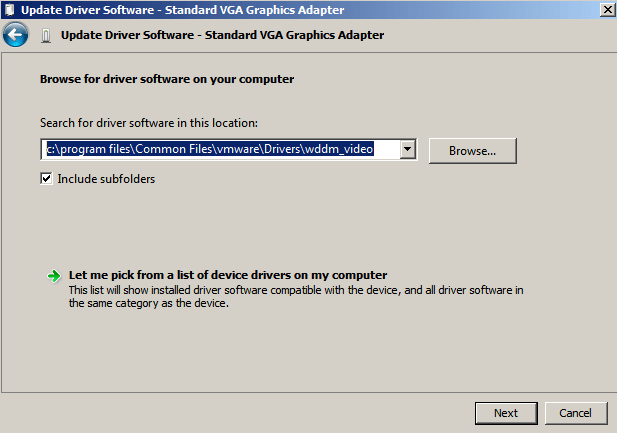 Can I install the drivers in the top(wddm) in a simple win7 machine which currently shows “typical VGA driver”? Sure. It doesn’t work on Windows 8 though.